The Fabric of the Cosmos DVD Review What a fascinating series. Welcome to the universe as hosted by Physicist and best selling author Brian Greene (The Elegant Universe) who has an uncanny knack of making the complex and scientific easy to understand. His latest endeavour is THE FABRIC OF THE COSMOS, a four-part documentary series, recently aired on SBS that contains four insightful episodes. These episodes include - What is Space?, The Illusion of Time, Quantum Leap and Universe or Multiverse. 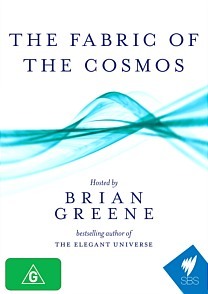 Apart from Greene, The Fabric of the Cosmos interviews a variety of experts such as William Phillips (UCA) to help give their theories on the world and universe or universes around us. The first episode is a great introduction into the mind and world of Greene who explains "what is" space. For example if we took "stuff" out of the universe, we would be left with empty space which according to Greene, it can ripple, bend and create the very fabric of the cosmos itself. Best of all, Greene explains these theories in laymen terms such as using a skater skating in "space". Greene also gives the viewer an interesting history lesson such as linking modern theories to Newton. Following episode 1 is the Illusion of Time that questions the viewer whether time is an illusion or is it something more. One theory believes that at the end of time, there will be nothing more than black holes and atoms spread across space. Originally there was one time for the entire universe but is believed to be nothing more than illusion as past, present and future may exist cohesively. Episode 3 is Quantum Leap that revolves around alternate realities and transportation that eventually mankind will be able to master. This also may allow for time travel. One interesting element is that every possible outcome actually happens in some parallel universe which brings us to episode 4. My favourite episode was Universe or Multiverse that touches on Parallel realities and the concept of the Multiverse which some scientists believe exists. Opposed to one universe, the Multiverse is a collection of universes and may be infinite. Some theories also state that there may be parallel versions of ourselves in these universes which really baffles the mind. So how did the multiverse come into existence? Mathematics was the answer but once again, proving the existence of other universes at the moment is virtually impossible and that perhaps in a hundred years, mankind will finally have the answer of either one or multiple universes. Even though Greene touches upon a variety of theories that are speculated by a variety of scientists, the fabric of the cosmos is still a mystery that is still yet to be discovered by mankind but when it does, it will be a scientific revolution.